Hands down, one of the toughest parts about your transition to college is the big move. Leaving home for the first time, finding a roommate, and trying to make your new living space suitable for two is definitely a challenging task. 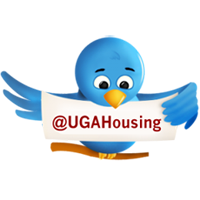 Nevertheless, year after year, UGA residents show us that they are more than capable of doing just that – and making it look good! Our annual Room-of-the-Year and Best Video Tour contests continue to be successful, with dozens of rooms being entered and thousands of residents voting on the winners. Each year, residents and roommate pairs come together and decide on color schemes, coordinate accessories, design, decorate and transform traditional residence hall rooms into pockets of exceptional décor and comfort. For the past two years, I’ve stood in the doorways of rooms wondering how they pull it all off, so this year I asked. Read what some of our recent Room-of-the-Year and Best Video Tour winners had to say about their decision to come to the University of Georgia, how they picked a residence hall to live in, and how they decorate their rooms to feel at home! Sarah Carnes, Hickory Flat, Ga.
Q: Why did you choose the residence hall that you live in? A: We did our research and knew that the Hill Community was home to some of the largest rooms, so that made choosing a residence hall easy. Our dads would probably tell you that a larger room translates into "more stuff" to carry up three flights of stairs! Q: What made you decide to come to the University of Georgia? A: It's a tradition! I come from a family of Bulldogs, so I've always bled red and black. I'm pretty sure some of my first words were "Go Dawgs!" Q: What one item did you bring from home that you just can't live without? Q: What's your best decoration tip for those moving into the residence halls? A: Well, there's not just one, but I can narrow it down to five! (1) Shop around for unique finds. My grandmother has always told me that a room should never look like you just went to one store and stocked up on everything. During the summer, hit up local antique or consignment shops. Half the fun of decorating our room was venturing to these stores looking for one-of-a-kind pieces. It's so neat to think that a good bit of the pieces in our dorm room "have a story." Don't be afraid to search through your grandparents' attic either. You might find lots of great pieces, or perhaps just one. Incorporating a piece of "retired" furniture allows you to have a piece of your grandparents with you. (2) Choose a color palette but don't feel like you can only use those colors; while we use mostly browns, oranges, and blues, we also brought in reds, greens, and yellows - and it works. by Pinterest and made by Sarah's grandmother. (3) It's inevitable that you will miss home, so transform your dorm room into home! Our warm color palette reminds me of my home, providing a sense of solace at the end of a long day. (4) If you can't find what you're looking for, make it! Our red pallet coffee table stemmed from a picture on Pinterest. It became a reality when my grandfather agreed to make it. My grandmother then "worked her magic" and voilá - we have a great rustic red coffee table that provides storage as well! (5) Splurge on a few good pieces. If you're going to spend the money, you might as well spend it on accessories that will spice up your dorm room and perhaps that apartment you have your eye on after freshman year. A: I initially wanted to be in the Hill Community, but I’m really glad I got Creswell because of all of the community I’ve built with all of the girls! A: I wanted to go to UGA because of the music program, and because of the awesome spirit that exists on campus. A: I’d probably say my map of Middle Earth. I don’t care if that sounds dorky. It’s an essential decoration. A: Don’t bring too much! It’s pretty tempting to go all out from Bed, Bath and Beyond, BUT RESIST THE TEMPTATION. Visit our Facebook page and our YouTube channel to view all of this year's Room-of-the-Year and Best Video Tour finalists. To view photos and videos from past years, visit our Room-of-the-Year board on Pinterest. Felicia Harris is the Doctoral Intern for New Media at University Housing. She is currently pursuing her doctorate in Mass Communication at the Grady College of Journalism and Mass Communication with research interests in Health Journalism, New and Social Media and Critical/Cultural Studies.